So when the craving hit me this time, I thought I would bake a bread-cake instead of buying another bar of chocolate that I would neglect to eat. I still wonder why they call this "bread" when it tastes like a cake? Anyway.. I made Nigella's Banana Bread, but adapted the recipe so I could make it into a chocolate version of the same cake. 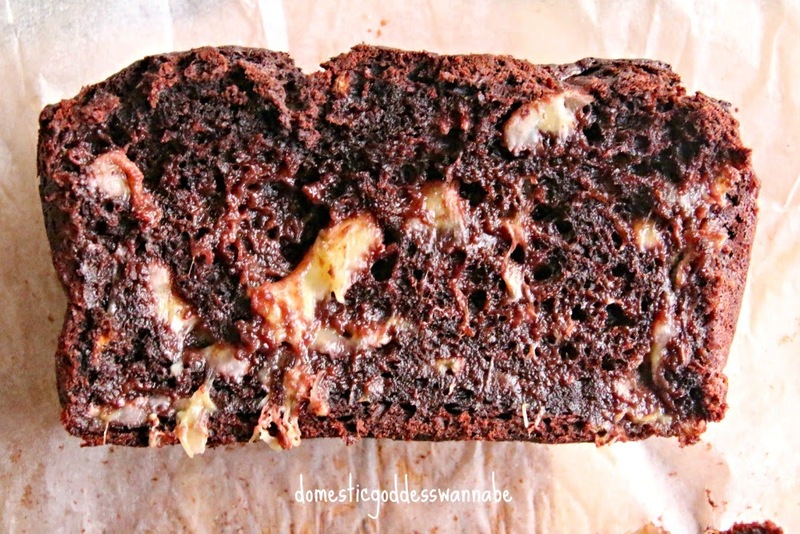 Pour the batter into a greased and lined 9x5-inch loaf tin. Bake for 50-60 minutes, or until a skewer inserted into the thickest part of the cake emerges cleanly. 1. Preheat oven to 170C. Prepare an 9x5-inch loaf pan by greasing it or lining it with baking paper. 2. Whisk melted butter and sugar in a large bowl until thoroughly blended. Beat in eggs, on by one, then the bananas. Stir in vanilla extract, and walnuts and sultanas (if using). 3. Sift flour, cocoa powder, baking powder, bicarbonate of soda and salt. 5. Bake for 60-75 minutes, until toothpick inserted into the center emerges clean. I bought a pack of curly pasta a few weeks ago. Well, on the package, it said, "Curly pasta" but upon checking, I think the correct term should be Cavatappi, which is a spiral tube shaped pasta with grooves on the outside surface of the pasta. They were just so cute, so I thought I might as well buy them first and think of what to make with them at a later date. In the end, I decided to pair the pasta with a thick stroganoff sauce. Stroganoff is traditionally made with beef and includes the addition of sour cream. It originated in Russia in the 19th-century and has become so popular that many, many versions now exist and look nothing like the original version. 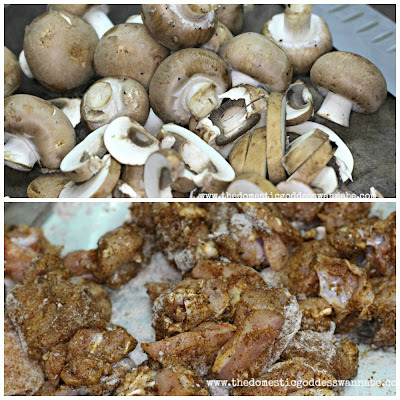 I am making my stroganoff today with chicken and mushrooms. 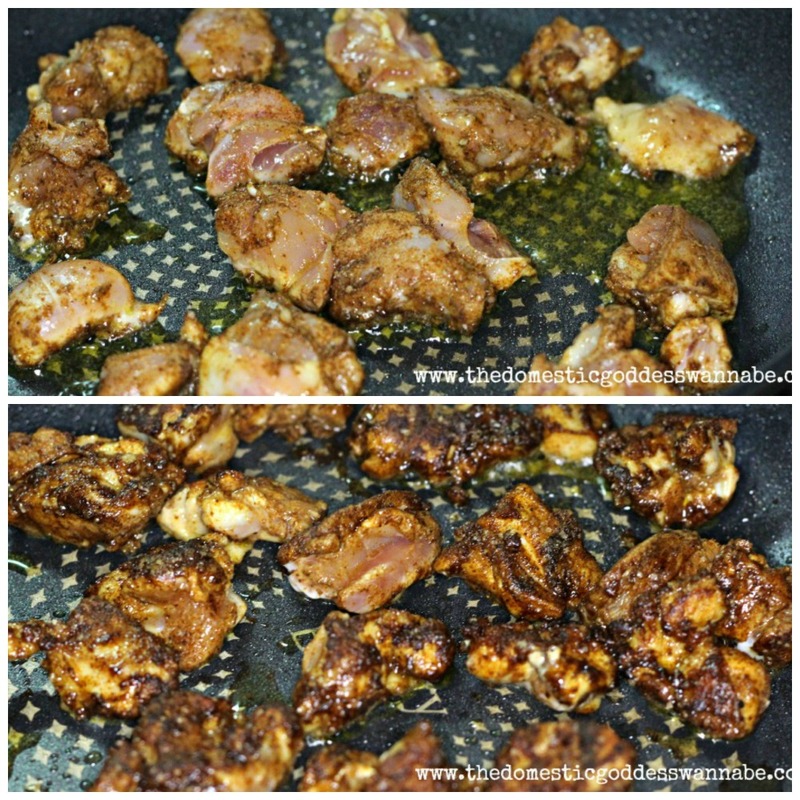 I seasoned the chicken thighs which I had already cut into smaller pieces with some paprika, flour, salt and black pepper. I also sliced some brown button mushrooms. 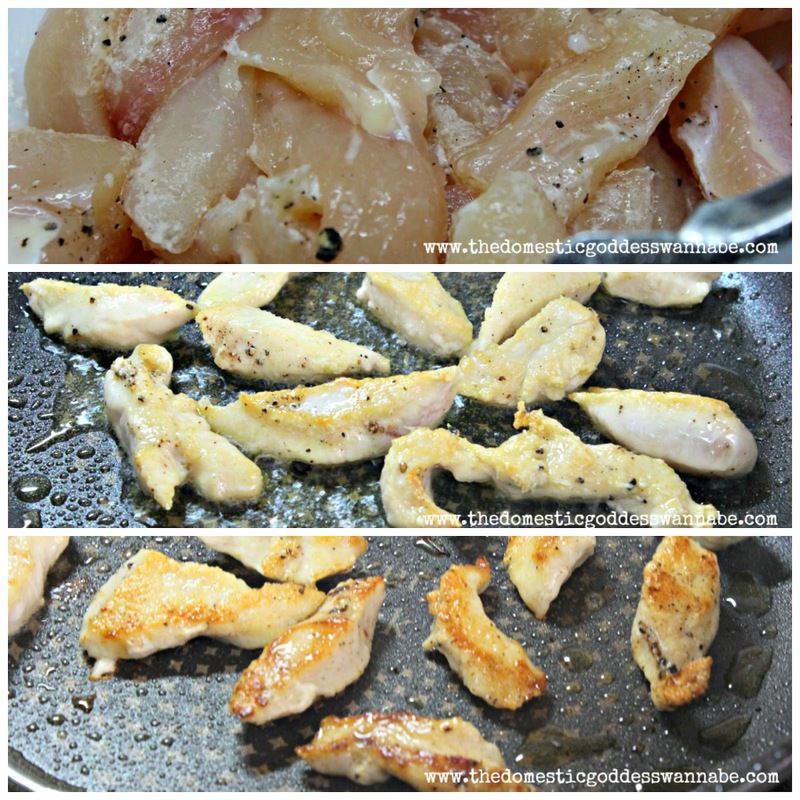 In a heated skillet, I added a little extra virgin olive oil and pan fried the chicken in batches. There is no need to cook the chicken completely as they will finish cooking at a later stage. The aim here is go get some colour on the chicken. Once done, the chicken was placed on kitchen towels to drain and set aside. Once the chicken was done, in the same pan I added the diced onions and mushrooms. 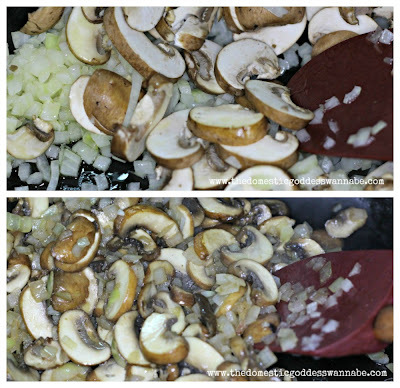 I sauteed them until the onion had softened and become translucent, and the mushrooms were cooked down. The minced garlic was added, and cooked for about a minute, and I added the chicken stock and tomato paste. Once everything was combined, the chicken was returned into the pan, along with a bay leaf or two. This was simmered until the chicken was cooked through. The sauce should thicken slightly at the end as well. I added the yoghurt (or sour cream if you have any) and stirred that into the sauce. I also added salt and coarsely grounded black pepper to taste. At this stage, if you prefer a thicker sauce, add some corn flour slurry (1 tbs corn flour + 2 tbs cold water) and stir it into the sauce. Let the sauce continue to simmer for another 2-3 minutes, and it is ready to be served. 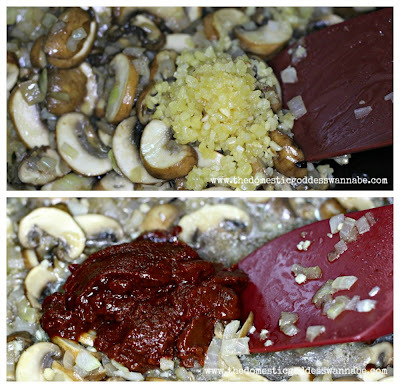 I served this with the curly pasta, but really, any pasta or even rice will work! 1. In a medium bowl or shallow pie plate, toss the cubed chicken with the paprika, flour, salt and pepper. Toss to coat. 2. Heat the olive oil in a large skillet over medium heat until rippling and hot. Add the chicken in a single layer and cook until golden brown on each side, tossing occasionally, about 5 minutes. The chicken will finish cooking fully a bit later so it doesn't need to be cooked all the way through. Scrape the chicken onto a plate and set aside. 3. Add another teaspoon of oil to the pan, if needed, and stir in the onions and mushrooms. Saute the mixture, stirring occasionally and scraping up the browned bits from the chicken, until the onion is translucent and the onions and mushrooms are browned, about 5 minutes. Add the garlic and cook for another minute, until fragrant. 4. Pour in about 1/4 cup of the chicken broth and deglaze the pan by scraping up any bits from the bottom. Stir in the tomato paste, whisking to combine. Add the rest of the chicken broth and the bay leaf, stirring well. 5. Add the chicken back into the skillet and simmer the mixture over medium-low to medium heat, until the chicken is cooked through and the sauce thickens slightly, about 5-6 minutes. Stir in the yogurt (or creme fraiche or sour cream) and cook for about 2-3 minutes longer. 6. 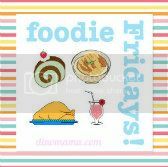 If you would like the sauce to be a bit thicker, make a cornstarch slurry by mixing 1 tablespoon cornstarch with 2 tablespoons cold water. Add the cornstarch slurry to the simmering mixture in the skillet, whisking quickly to combine. 7. Let the mixture simmer for 2-3 minutes until thickened. 8. Serve over hot pasta and garnish with fresh parsley, if desired. I was out having dinner with my cousin about a week ago and she mentioned "Te Kar bee hoon", a.k.a Pig's Trotter bee hoon, and the words were sort of planted in my head. As the week progressed, I found myself buying a head of cabbage and more shallots. Knowing that I had three cans of pig's trotters with mushrooms in my pantry, I finally gave in to that little voice inside my head, and bought a packet of bee hoon today. This dish is really easy to make, and few ingredients are needed. 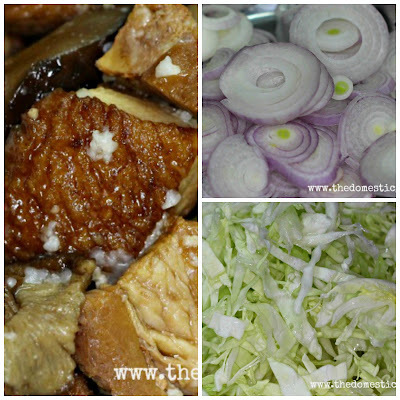 Apart from garlic, which does not really count, since everything I cook includes garlic, the rest of the ingredients needed are pig's trotters (I cheated by using canned ones), shallots and cabbage. 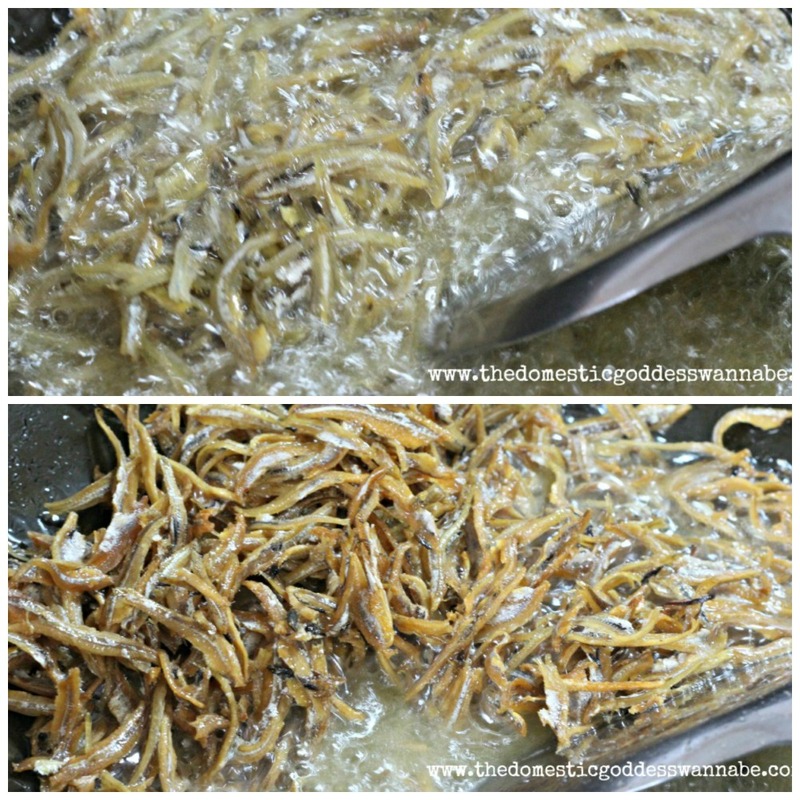 In a heated wok, I fried the shallots in a little vegetable oil until they had softened and become translucent. I added garlic and the cabbage. At this stage, I also added 2/3 of the liquid that came with the trotters, soy sauce and grounded white pepper. It is very important that the liquid is added because the been hoon, which in itself is tasteless, will absorb the liquid and become super yummy. 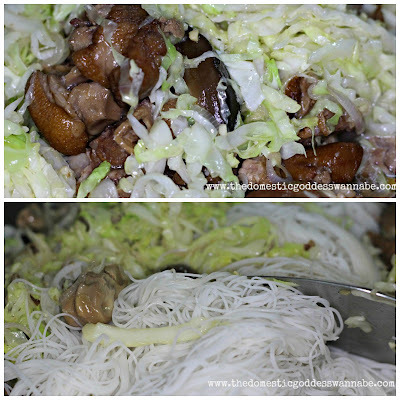 When the cabbage had softened, I added the pork, gave everything a stir or two, before adding the bee hoon, light and dark soy sauce as well as the pepper. Keep stirring the bee hoon, to allow it to absorb the liquid. 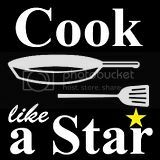 Once that happens, it is time to eat! 1. Heat oil in wok. 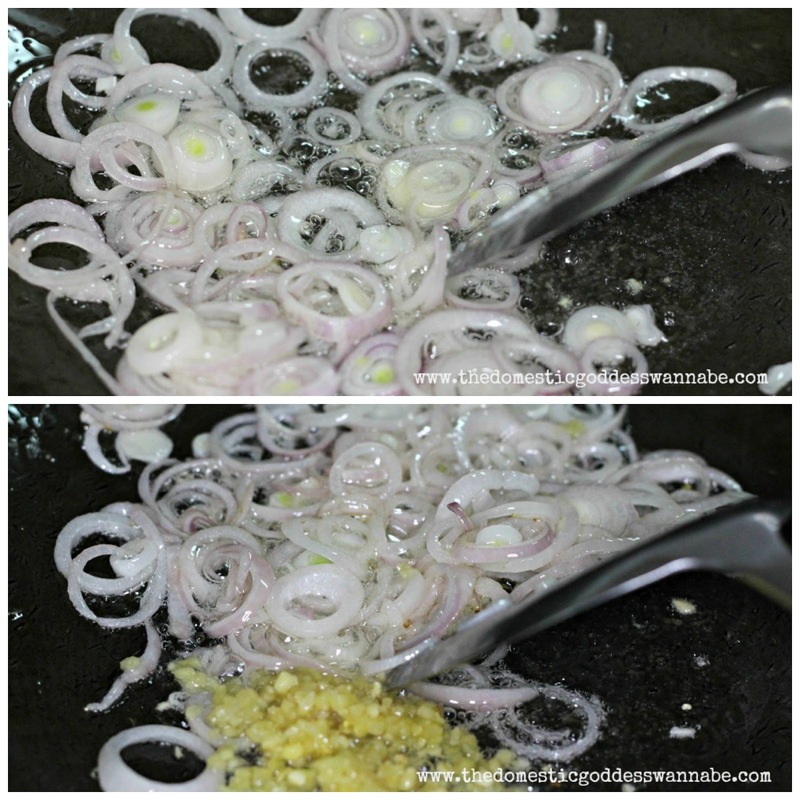 Saute shallots until softened and have become translucent. 2. Add garlic, saute for 30 seconds. 3. Add cabbage and 2/3 of the liquid from canned pig's trotters. Cook until cabbage has softened. 4. Add trotters, bee hoon, light and dark soy sauces and pepper. 5. Turn heat down to medium, and stir the bee hoon so that the liquid is absorbed completely. I am fascinated by pasta. All these different shapes for different sauces. I like buying different types of pasta and trying to make different things with them. One of the easiest pastas to cook with is definitely orzo. Orzo, also known as risoni ("big rice" in Italian) is a type of short pasta that is shaped like a large grain of rice. It is usually used in soups, as part of a salad or baked in casseroles. I wanted to cook the orzo in a creamy sauce but I did not have any cream in the fridge, so I used the next best thing - cream of chicken soup. The first step was to brown the chicken. I used chicken breast because they are a lot easier to slice than chicken thighs. The chicken was browned in a little extra virgin olive oil in batches and placed on some kitchen towels to drain after. The chicken need not be cooked through as they would be cooked again later. In a large skillet, I browned the diced onion in a little olive oil until the onion became soft and translucent. The garlic was added and I continued stirring for about 30 seconds. 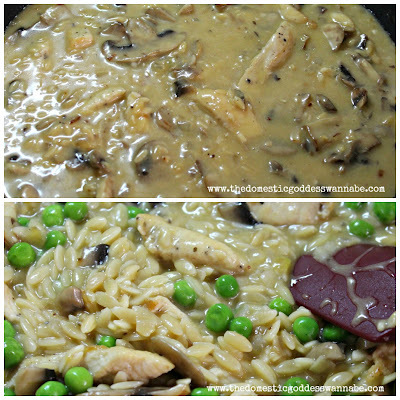 I added the sliced mushrooms and continued cooking until the mushrooms were cooked down before the chicken and orzo were added. I stirred the mixture so that the orzo was coated with the oil. Then I added a can of cream of chicken (you can also use cream of mushroom), water and frozen peas. Everything was given a good stir so that they were well-combined. I brought the mixture to a boil, then turned the heat down and simmered the mixture, covered, for about 15 minutes. It is important that you give the mixture a stir every so often. If the orzo starts to stick to the bottom of the pan, add a little more water. When the orzo was cooked, I added chopped tomatoes, salt and coarsely grounded black pepper and dinner was ready to be served. This is a simple, one-pot meal. 1. Season chicken with salt, pepper and corn flour. 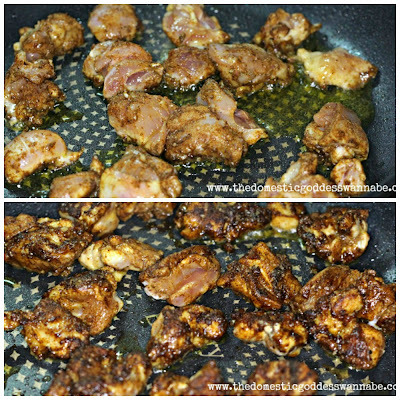 Cook chicken, in batches, until well browned in heated oil at medium-high heat in large skillet. Drain on kitchen towel and set aside. 2. Cook onions for about 3-4 minutes until they are soft and translucent. Add garlic and saute for another 30 seconds. 3. 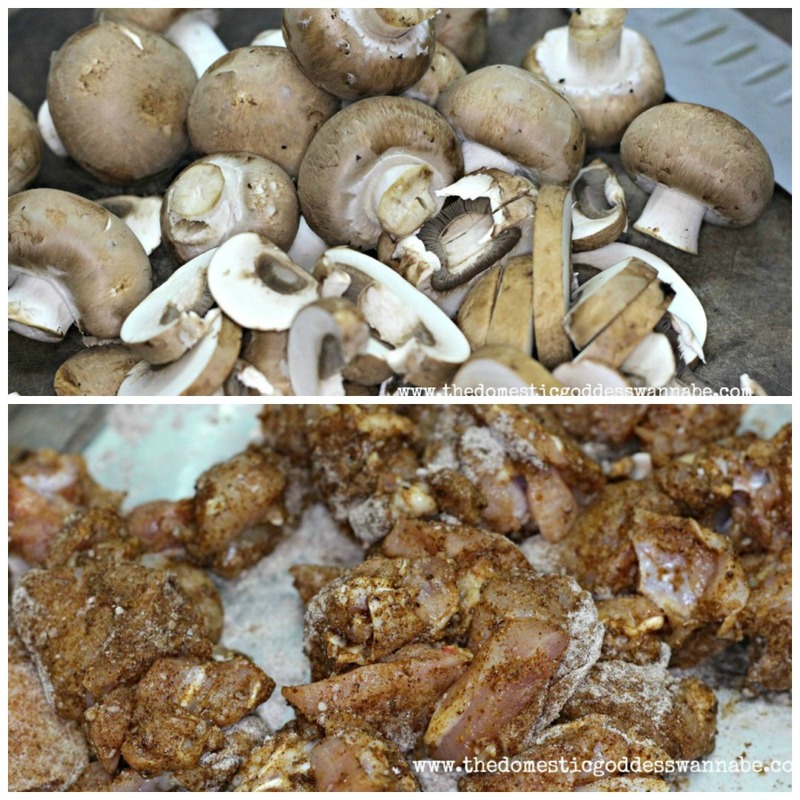 Add mushrooms and cook until they have become soft. 4. 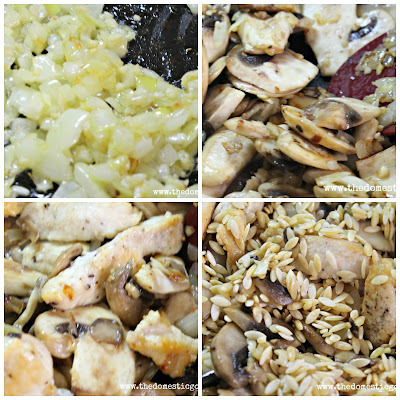 Put chicken back into the skillet, add orzo. Stir to coat the orzo with the oil. 5. Add cream of chicken, peas and water. Stir to combine. Cover, bring to boil then turn down the heat and simmer for about 15 minutes, or until orzo is cooked. Stir often. 6. Once cooked, add chopped tomato and salt and pepper. Stir to combine. Call me a weirdo, but as much as I like quick and easy recipes, there are days when I really like making food the old-fashioned way. I like pounding chillis and aromatics with my pestle and mortar, and I like the idea of cooking with a charcoal fire. The latter is not allowed where I live (fire hazard) so I can only experiment with the former. 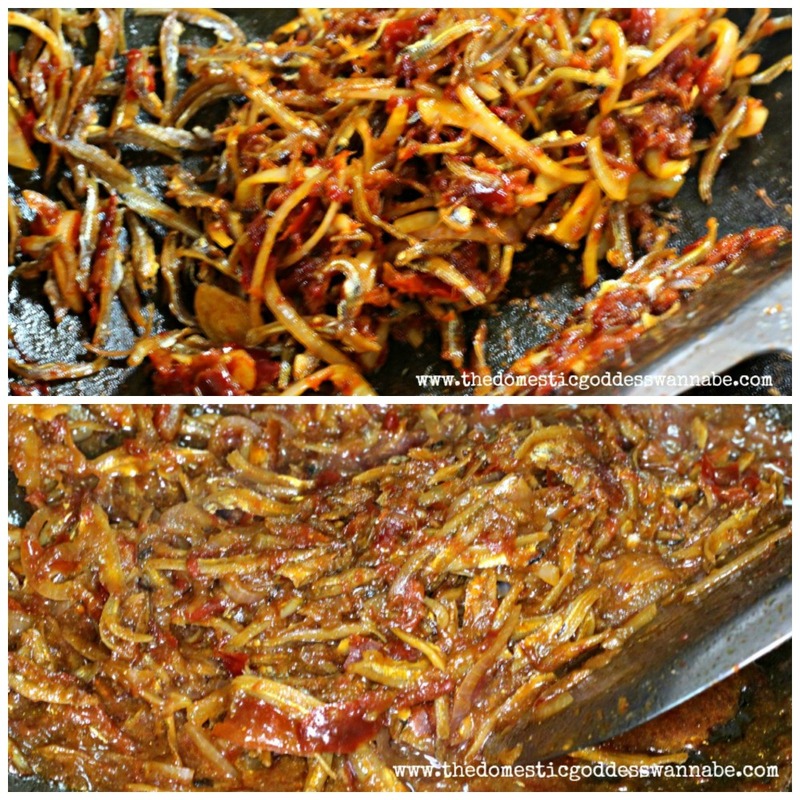 When I saw this recipe for sambal ikan bilis, I wanted to make it immediately. Since I was making nasi lemak for dinner, this would be a really nice addition to the meal. 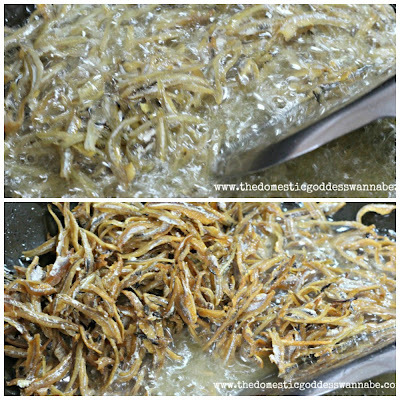 In a heated wok, I heated some vegetable oil and fried the ikan bilis. They were placed onto a kitchen towel to drain when they have turned crispy. To make the sambal, I pounded shallots, garlic, dried chillis and belacan (prawn paste). Once done, in a heated wok, I added a little vegetable oil. Into this, I added the spice paste and fried it until it was fragrant. Then I added the sliced onions and fried for a minute or so before adding the ikan bilis. This was stirred to mix, before the tamarind juice and sugar were added. I turned the heat down to low and cooked the ikan bilis until the gravy had thickened. I served my nasi lemak with grilled turmeric and paprika chicken wings, and long beans fried with hae bee hiam. I also boiled some eggs and halved them, fried some peanuts and sliced some cucumber to go with everything. tamarind juice made from tamarind pulp (about the size of a ping pong ball), mixed with 1 cup water for about 15 minutes, stirring often, and drained. 1. Rinse the dried anchovies and drain the water. Fry the anchovies until they turn light brown and set aside to drain on kitchen towels. 2. Remove seeds from dry chillis and soak in water for about 15 minutes to rehydrate them. Drain. 3. Pound the prawn paste together with shallots, garlic, and deseeded dried chilies with a mortar and pestle. You can also grind them with a food processor. 4. Slice the red onion thinly. 5. Soak the tamarind pulp in water for 15 minutes. Squeeze the tamarind constantly to extract the flavor into the water. Drain the pulp and save the tamarind juice. 6. Heat some oil in a pan and fry the spice paste until fragrant. 7. Add the onion rings and fry for a minute or so. 8. Add the ikan bilis and stir well. 9. Add tamarind juice and sugar. 10. Simmer on low heat until the gravy thickens. When he realised (years ago) that I had never had a REAL peach, or nectarine, he was speechless. And since we could never make the time to go to Australia for the stone fruit season, I still have no idea what a REAL peach or nectarine tastes like. Since it is a waste of money buying peaches or nectarines (for eating) in Singapore where we currently reside, I settled for the next best thing. I use them for baking instead! So I made this gorgeous, gorgeous cake. 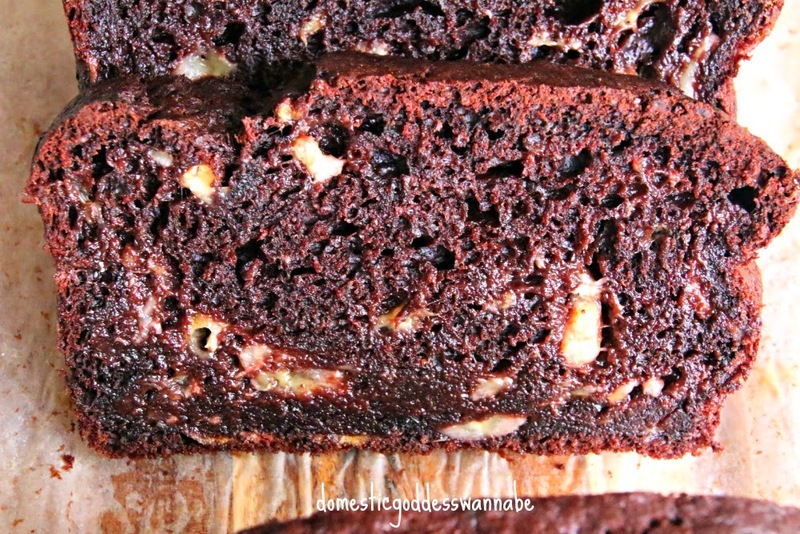 Moist, tender and not overly dense, this is really a great cake to make for a party or a small gathering. It all started with finding some peaches. Peaches, being an imported fruit, can be very expensive. I was really lucky because I found some white peaches that were on sale. So I bought 4 peaches, which was sufficient to make the cake as well as the puree for the glaze. You will need to remove the skin of the peaches. The way to do this is to blanch the peaches (one by one) in really hot water, and then placing them in ice water so the skins are loosened and can be peeled off easily. No idea what strangeness I am sprouting? No worries, watch this video for a detailed explanation. Once the peaches have been peeled, dice them into small pieces, squeeze a little lemon juice on them to prevent them from browning, and set them aside. 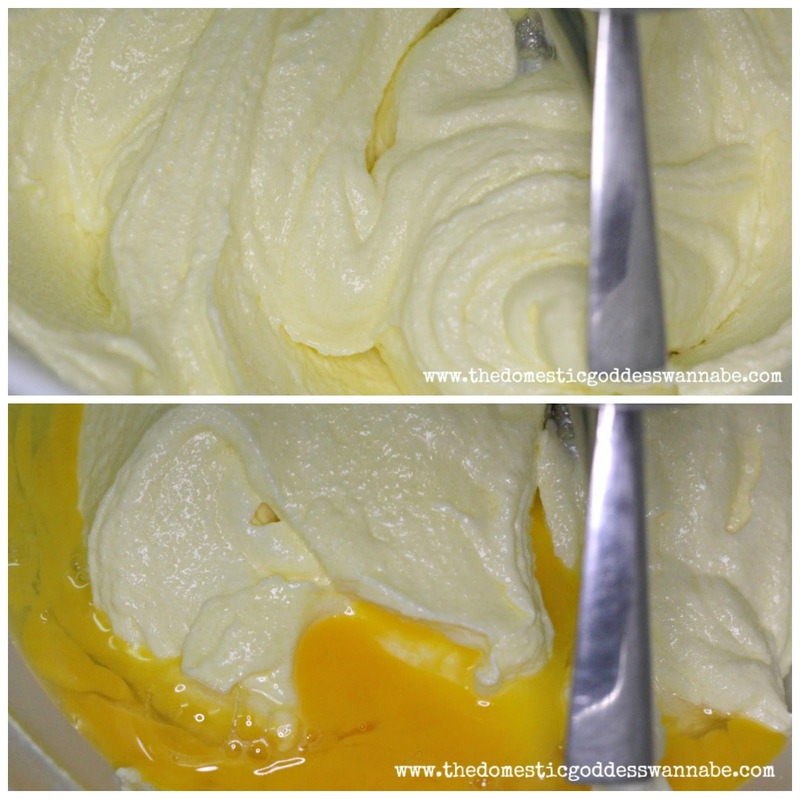 In a bowl of a mixer, cream the butter and sugar until the mixture turns light and fluffy. Add the eggs, one at a time, and beat after each addition for about a minute until the egg has been incorporated before adding the next. Into this, I added vanilla bean paste, since I did not have any pods. And the flour and sour cream in the sequence flour-sour cream-flour-sour cream-flour. Once all the flour had been incorporated, I spooned about half of the batter into a greased Bundt tin. Then I placed about 3/4 of the diced peaches on the batter and covered them with the remaining batter. The cake was baked for about 50 minutes and allowed to cool in the pan for about 15 minutes before I inverted it onto a wire rack. While the cake was baking, I made the peach syrup by pureeing the remaining peaches, and straining the puree to obtain a smooth mixture. Into this, I added sugar and orange juice and cooked this over medium heat until the sugar had melted. I brushed this generously onto the warm cake, allowing the syrup to be absorbed before reapplying more syrup. This is one gorgeous cake (forgive me for the repetition), no matter which way you look at it. 1. Preheat oven to 170C. Grease and lightly flour inside of 10 inch bundt pan. 2. 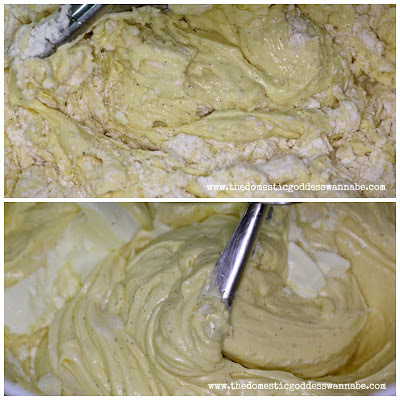 Whisk together flour, baking powder, baking soda and salt in a large bowl. Set aside. 3. Using either a stand mixer (paddle attachment) or a hand mixer, beat the butter at medium speed until creamy, about 2 minutes. 3. Gradually add sugar and beat at medium-high speed until the mixture is light in texture and color, about 3 minutes. 4. Beat in eggs one at a time, beating for one minute after each addition. Scrape down sides of bowl as necessary. 5. Beat in vanilla bean. 6. At low speed, add flour mixture in three additions, alternating with sour cream. 7. Scoop half of batter into pan and spread with spatula. Sprinkle with peaches. Scoop remaining half of batter on top of peaches. Smooth with spatula. 8. Bake cake for 50 to 60 minutes, or until a tooth pick inserted in the center comes out clean. 9. Cool the cake in the pan on a cooling rack for 15 minutes, then invert it onto another rack. 10.Place the cake, on the rack, over a baking sheet. 11. While cake is baking, make syrup. Combine peach puree, sugar, and orange juice in a small non reactive saucepan and cook over medium heat, stirring until the sugar dissolves, 3 to 4 minutes. 12. Remove pan from heat. Using a pastry brush, dab syrup generously all over surface of the warm cake, allowing it to soak into the cake before reapplying. Let the cake cool completely.